Most windows give you a view of the outdoors, but if you want to bring the outdoors inside your home, consider a garden window. In a small space, garden windows can provide a peaceful oasis in your home. Garden windows also provide beautiful spaces to grow plants indoors, and can bring the spacious, calming feeling of the outdoors into your home, without letting in the cold. A garden window is a mini-greenhouse that extends outward from your home. 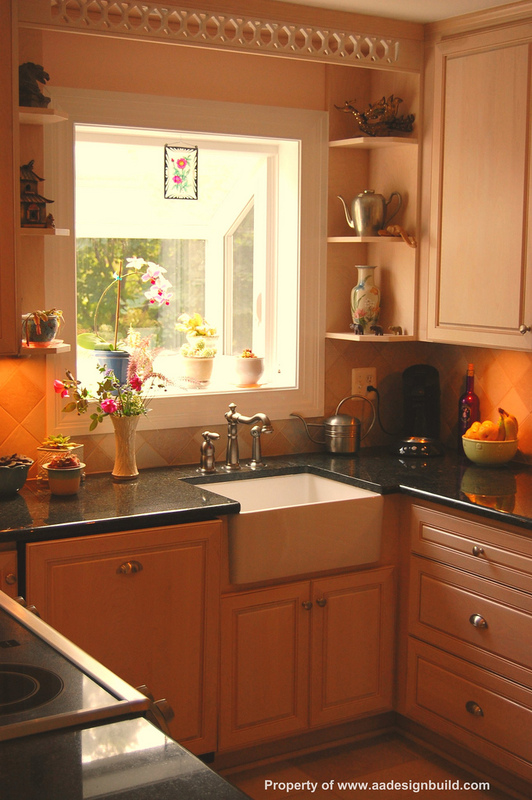 Usually found in the kitchen, garden windows have a fixed window in front, two operable side windows to provide ventilation, and one or more shelves to put plants on. Garden windows also usually feature a glass roof, which is sloped to ensure quick water runoff when it rains and to allow extra sunlight to stream into your home. Because garden windows extend beyond the house, homeowners should avoid placing a garden window in an area where it would interfere with sidewalks, patios, or other exterior features. As the name implies, garden windows allow you to turn part of your home into a small garden. With this kind of beautiful window, you can garden year-round. Garden windows also provide a great place to start plants in the winter before replanting them outdoors in the spring. Similarly, garden windows are a wonderful place for a small herb garden, which will give you convenient access to fresh herbs while you cook. As well as providing an attractive showcase for your plants, a garden window also lets in fresh air and light into your kitchen. How Long Will Your Garden Windows Last? Garden windows are designed with durability in mind. Nowadays, they are typically made with durable and maintenance-free vinyl frames, and have bases made of moisture-resistant materials for worry-free plant watering. With proper installation and materials, your garden window will provide enjoyment and beauty for years to come. Because they are constructed of glass panels joined together in a box, garden windows can make energy efficiency tricky. The good news is that there are a number of ways to make your garden windows as energy efficient as possible. Garden window frames should be constructed of vinyl, aluminum, or wood because these materials allow the glass panels to fit together securely, keeping out air and moisture. When considering glass for your garden window, you’ll want to pay special attention to two energy efficiency ratings. A garden window has more glass panels than most windows, so its U-factor (a measure of airflow through a closed window) is an important rating measure. Look for a lower U-factor to ensure maximum efficiency. The solar heat gain coefficient (SHGC) measures the amount of radiant heat a window lets in, and you’ll want to look for a lower number with this measure as well. For maximum energy efficiency, consider low-E coated glass for your garden windows. Whether you’re an avid gardener looking for a way to garden year-round, or simply want to add light and beauty to your home, a garden window may be the perfect new addition to your home.